Ignorance is bliss as far as Sutech Building Consultants skipper Daniel Turner is concerned as he prepares for the 2018/19 NSW 16ft Skiff Championships. Turner has done his best to resign last year’s campaign to the history books after Sutech finished a disappointing 13th overall following just the solitary top 10 placing across four heats. And the skipper is not too keen to dissect the form of his main rivals ahead of the final two heats at Gosford on December 1-2. Turner believes it’s all about what Sutech needs to get right, not so much what other boats are up to. “We’ve just tried to make it about us and not get too caught up in what the others are doing,” he explained. “It’s always a quality fleet for the States and any one of about 10 boats are genuine contenders, so the more you think about the competition, the more sleep you lose. “We have kicked off with a fair bit of momentum and are in a lot better position than in previous seasons. “After sailing together for so long you start to think what else is there to learn, but we’ve been developing new things, increasing communications, refining things on the boat. “We have had no issues or breakages. Things could not have gone much better. “I’ve got a really good feeling based on what we’ve learnt in just a few races. Sutech’s Manly stablemates Surf n Slide (Dave O’Connor), Lancelin Ropes (Sarah Lee) and Koreman Marine (Felix Grech)) are among the main contenders, with Brydens Lawyers (Lee Knapton) from St George and Newcastle’s Southern Beaches Rugby (Rod Carter), Starr Facility Services (Henry Makin) and Fire Stopping (Will Howard). Lee Sails during the 2018 Peroni 13ft & 16ft Skiff Nationals out of MH16’s. Photographer: Michael Chittenden. Copyright: Middle Harbour 16ft Skiff Club. O’Connor has a rich history in the 49er and 18ft classes but is fulltime at the helm of a 16ft for the first time. He has big shoes to fill, replacing reigning Australian champion Joe Turner. “My job is being made easy by having two blokes like Trent (Barnabas) and Rob (Napper) in the boat…just look at how many titles those blokes have won between them. After an almost unbeatable position, winning both races during the first heat at Port Hunter. O’Connor has to carry on the work of Nathan Wilmont, who steered the Surf’n Slide to victory in the first two heats. Lancelin Ropes skipper Sarah Lee heads the female charge at the States and is aiming high. “Lately we’ve been getting some great results in the heavier breeze. “We have really broadened what we consider our ideal conditions and have been consistent across various wind ranges this season. “We’ve always been known as light wind specialists but not anymore. He has piloted Bryden Lawyers to the last four NSW Championships and reckons they are tougher to win than an Australian 16ft crown. “It’s harder to win than the nationals because they’re not held at the same location,” Knapton explained. “You don’t build up any momentum because you race two heats and then have a weekend off and then race another two heats at a different location. “This year will be very interesting. We have been a bit slow getting on the water due to work commitments but we think we can pick it up quickly. Bryden’s experience in all conditions will be invaluable over the State Championships. Emerging out of Port Hunter with a 3rd place, puts them in good stead for Gosford. He’s on the sheet aboard Southern Beaches Rugby (Rod Carter) and found Port Hunter to be a challenge. “Port Hunter can be crazy place to sail. You can get a ship taking up half the riverway,” Gillson said with a laugh. “You can be leading and might have to stop the boat and have the fleet catch up to you. “And with all the high-rise buildings, gusts come from nowhere. You’ve really got to be on guard the whole time. “If you get a podium finish you’ve really earned it. The 16’s are seeing an emerging youth talent streak, with Cunninghams breaking out to place top 5 in both heats to place 2nd overall and Koreman Marine Composites sitting in a notable 5th place behind Fire Stopping. 13ft Skiffs are also competing as part of the NSW Skiff State Championships, showing the logical skiff progression for youth sailors. After seeing the Flying Ant fleet sailing out of Port Hunter, the 13’s presence was certainly admired. Bartley Construction (Daniel Heyworth and Daniel Bromelow), The Kitchen Maker (Zac and Jake Barnabas) and Bruce (Will Divola and Alastair Hunter) battled it out for the top 3 places at Port Hunter, with Bruce & The Kitchen Maker both sitting in first place. Promoting the class is something the Divola family know too well. Andrew Divola has been a fantastic supporter of the class, creating enthusiasm within the sailors in the class, including his son Will. Bartley Constructions attempting a sneaky port hander during the recent Port Hunter States. Photographer: Neil Pinnington. The Barnabas boys come off a famous production line of sailors, with grandfather Trevor and father Trent successful and well-known figures in the skiffs ranks. The family is a big supporter of the 13ft class. “This class needs plenty of love because it’s a great stepping stone to the 16s and beyond,” Trent said. “We need to build the numbers and the States are the perfect way to promote the class. With such a close scorecard in both fleets, the next round at Gosford will prove to be a test of consistency and determination. Gosford provides a course that will keep the fleet on their toes, with Surf’n Slide keeping one eye backwards and the next contenders hot in pursuit. 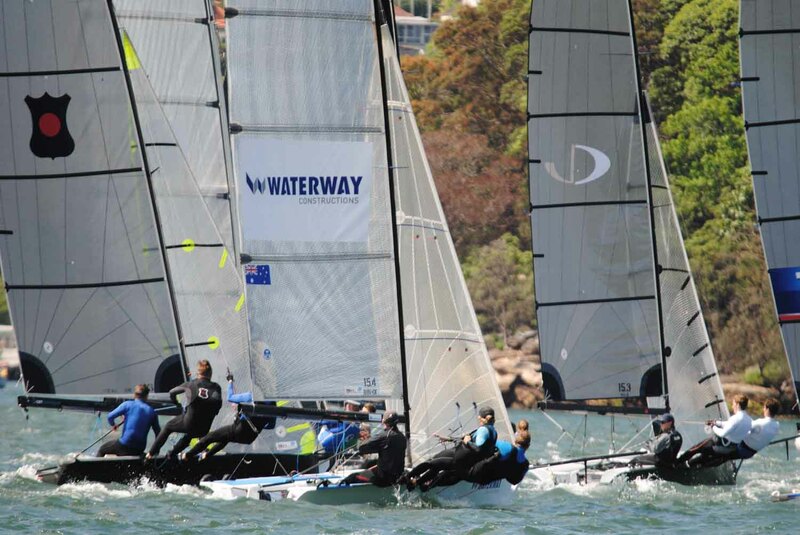 A fantastic day of racing was held by Drummoyne Sailing Club last Saturday. Boats from as far down as Illawarra, took the trip up to the Upper Harbour for some landmass ping-pong, testing everyone’s boat handling and adaptability to what was quite a difficult breeze. David Mitchell on Waterway constructions used their home ground advantage to take out the handicap for the day, with ADCO Constructions from St George jumping in behind at second. Toogara doubled up their podium for the day coming in third place on handicap. Thanks to all the organisers at Drummoyne for hosting a great event – we’ll all be back next year!